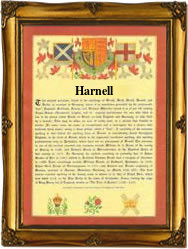 Recorded in a wide range of spellings including Harnwell, Harnall, Harnell, Harnel, Harnill, Hornell, and Hornwell, this is an English surname. It is certainly locational and possibly originates from the village of Harnhill in the county of Gloucestershire, although this is not proven. If this is not the case then the name is either a transposed spelling of some place which we have not recognised in the gazetters, or more likely is one of the three thousand and more surnames of the British Isles that originate from now "lost" villages. The lost medieval village is a phenomena which has only been recently recognised and much research remains to be done to identify the sites and cross match with surviving surnames. In anycase this suirname being locational is a "from" name. That is to say it was a name given to a person as easy identification after he or perhaps she, left the original homestead and moved elsewhere. Spelling being at best indifferent and local dialects very thick, lead to the development of "sounds like" spellings. In this case examples of recordings taken from early surviving church registers of the diocese of Greater London include: Dorothy Hornell, a witness at the church of St Mary Somerset, on August 8th 1596, John Harnwell who married Elizabeth Drew on April1st 1714 at St. Mary's Lewisham, David Hornwell, a witness at Christ Church, Spitalfields, on January 22nd 1758, and Jabez and Frances Harnwell, who were christening witnesses at St Dunstans in the East, Stepney, on September 19th 1830.